We have our first reservations made for Mother's Day weekend. At my request. Two of our grandkids will be joining us ... so excited! We spent the last week at FDR SP in Pine Mountain GA. Returned home yesterday. Surprisingly warm for this time of year. We are camping at Texas Motor Speedway this week end. Looks like rain today. May have to stay an extra day to see the race. I agree, packing up in the rain is a pain. Hate to pull the slideouts in when they are wet. Agreed I still need to install slide toppers. Pics of Mayberry Camground, nice place to stay. Sure! Picked up our very first TT on Friday morning and spend two nights at Ft. Cobb State Park in OK. This has always been a favorite for us when tent camping, so it provided a known location for our first time out. Can't wait for next Friday! A lot of folks call FDR run down, actually I like it. It's been the inaugural camping trip for both of my campers so far. One thing I'd like to see them improve, widen the roads a couple of feet. It wasn't an issue, but was tighter than I like to deal with. Family of 4 whose always on the GEAUX! 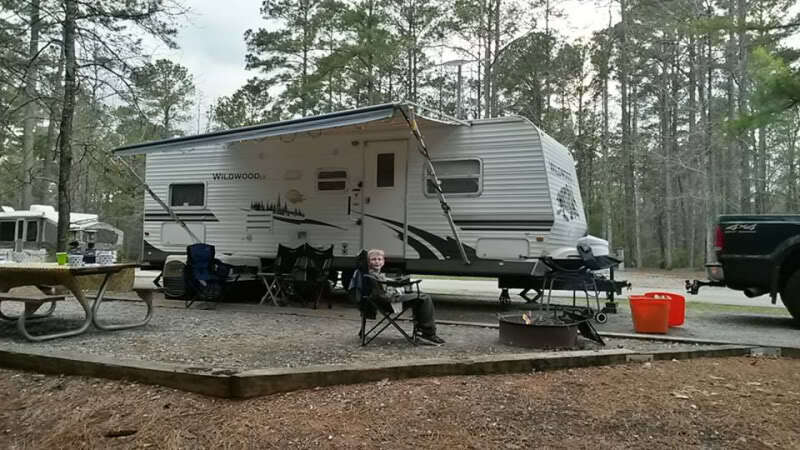 Camped at Jordan Lake this past weekend, along with a bunch of other people. The place was nearly full. Due to DW and my schedule, we figured it would be the only available weekend for a while. I was happy to see that the TT survived the winter.